Powerful Gamer. 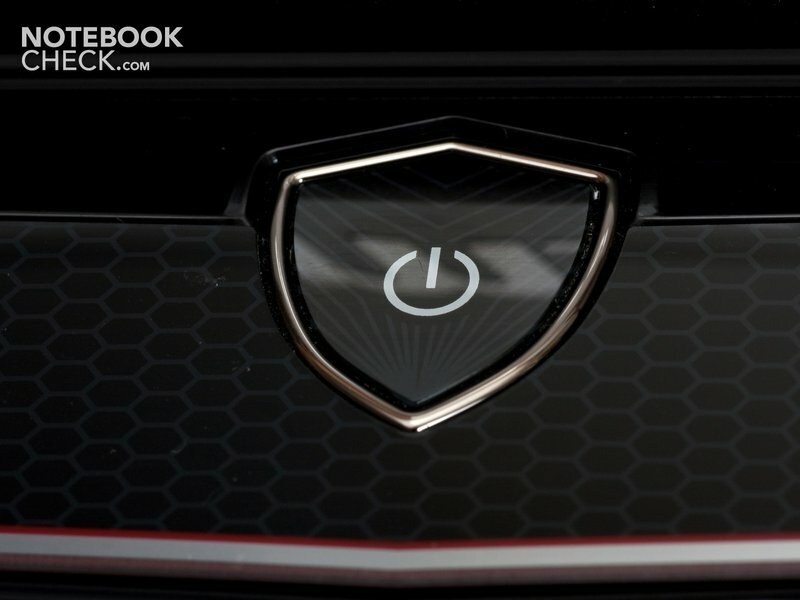 MSI is offering the new GX660R, a powerful gaming notebook with a swanky design. The hardware in place here will get the heart of any gamer to pound with excitement. Whether the MSI GX660R doesn't just look good on paper but actually lives up to its specs, you'll find out in the following review. 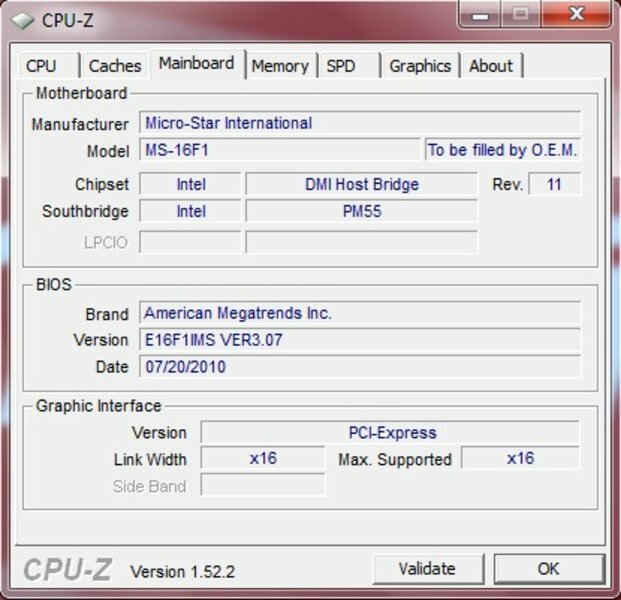 MSI (Microstar International) is a big name in the computer industry. They deal mostly in mainboards and graphics cards but has also made a name for themselves in the area of laptops. 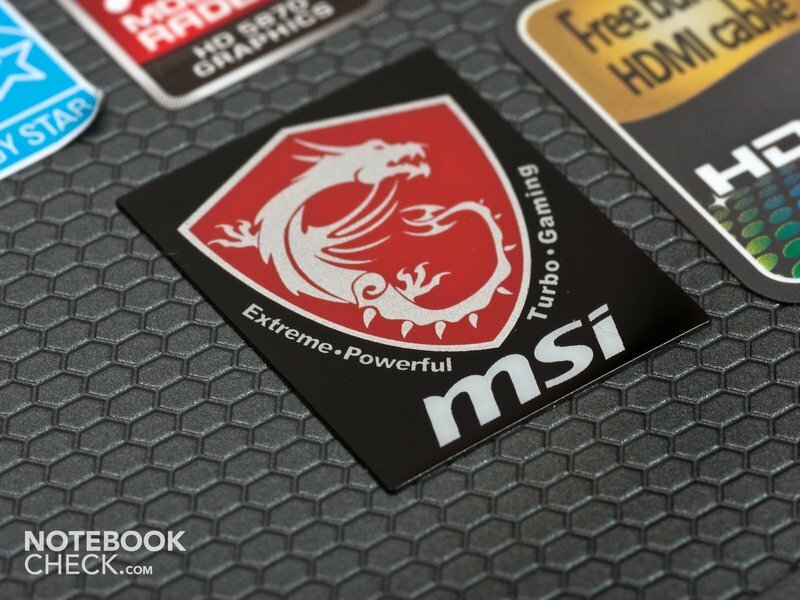 Just about everywhere, MSI's notebooks are branded as such, but the company also offers barebones notebooks that are sold by other businesses under their own name. 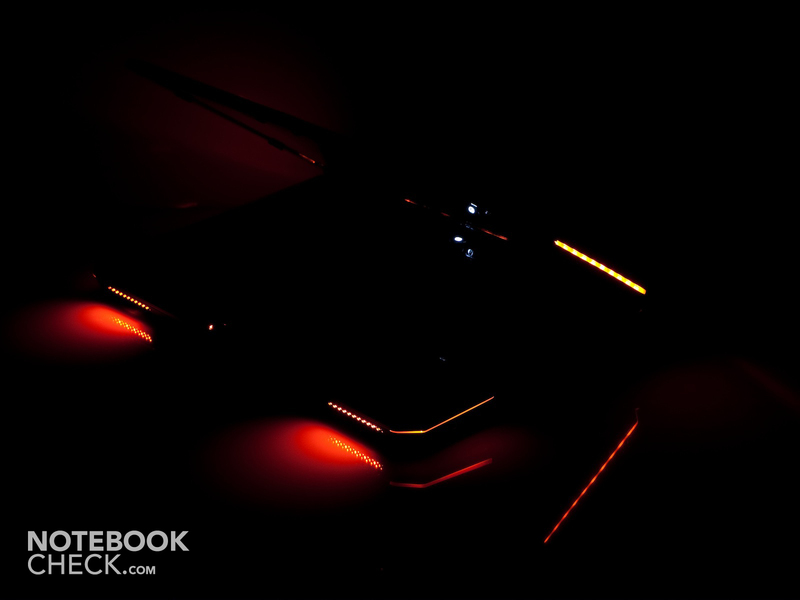 MSI is, of course, a world-class player in the gaming notebooks business. Not long ago, we reviewed the MSI GT 660R, a comparable, structurally identical model (GT: Nvidia Graphics Card, GX: ATI). 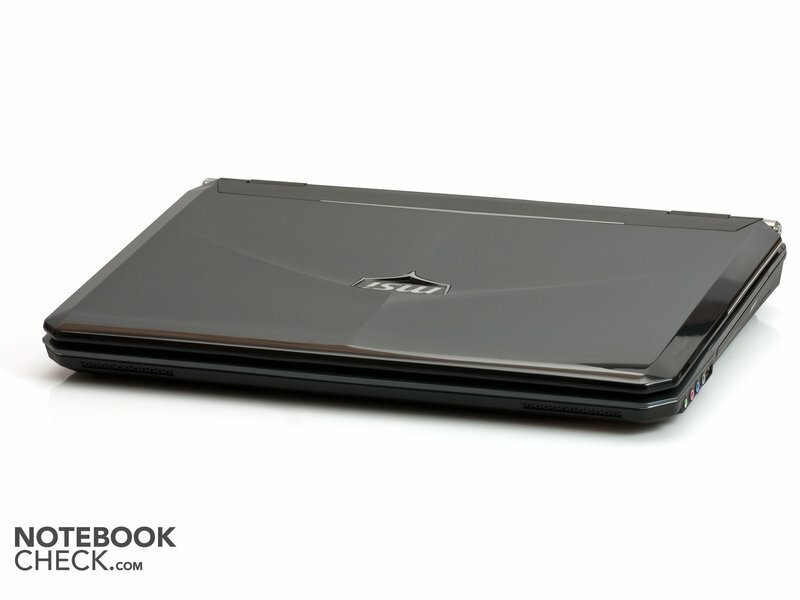 MSI has expanded its gaming notebook portfolio with the new, powerful MSI GX660R. 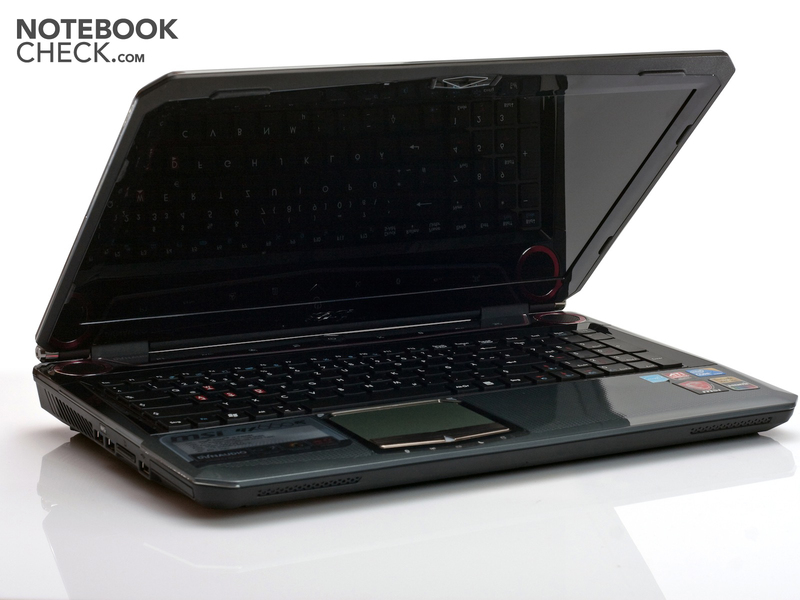 The Intel Core i7-740QM quad-core processor as well as its ATI Mobility Radeon HD 5870 graphics card should allow the notebook to run current games with no problem at all. The speaker system from Dynaudio does a fine job of accompanying games and movies with good sound quality. Whether this notebook makes a lasting impression or is just a load of hype, we discuss in our extensive review below. 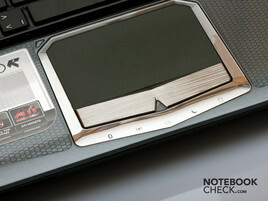 Note: A preproduction model of the GX660R was used in the following review. According to MSI, various changes have been made to the models that will be available for purchase including improvements in the keyboard and the introduction of a full-HD display. We will update this review as soon as we receive the new sample, which is already on the way. The case of the new MSI gamer is composed completely of plastic. The display is particularly glossy. After only opening up the notebook a few times, you can see some ugly finger print marks on the display cover. Nevertheless, the quality of the sturdy build leaves no rooms for complaints. The palm rest is also made of shiny plastic, but its honeycomb texture hides fingerprints much better than the smooth case exterior. The notebook doesn't fare quite as well in the so-called pressure point tests. The palm rest can withstand pressure quite well and doesn't give even when we firmly press down on it. It's another story for the area above the optical drive, where the case tends to bend quite a bit in response to pressure. Also, the area directly above the keyboard caves in to pressure directed at specific points. Furthermore, pressing specific points on the display cover (exterior) distorts the picture on the screen. In spite of this, the case is quite resistant to twisting, leaving no danger of the case becoming warped. MSI has gone with a sleeker and simpler design for this model. 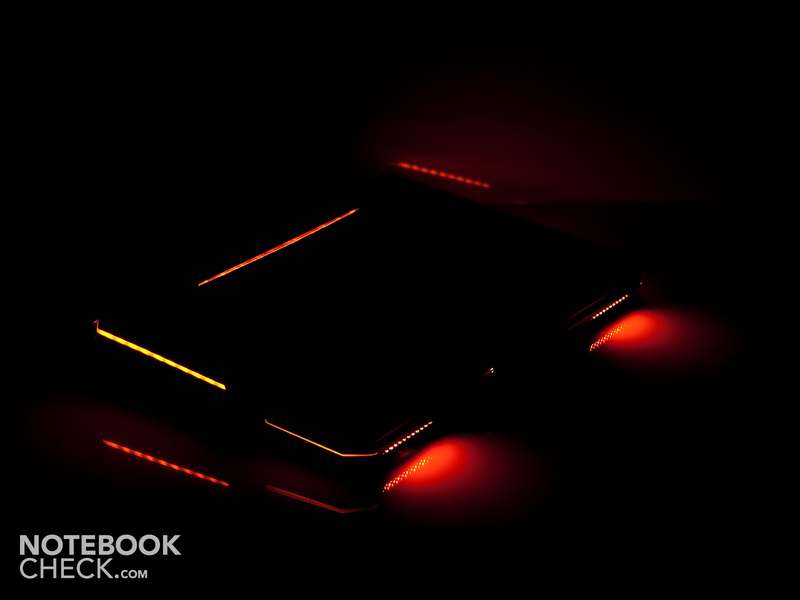 The black case with touches of reddish orange is not as tacky as some of the competition's gaming notebooks. The design as a whole has a harmonious effect, even the showy details like the "chrome" display hinges or the cover's convex shape fit in nicely. The case lighting emits a subtle, pleasant glow. MSI avoids a large, brightly glowing display cover, instead accenting the design with thin luminous stripes, which can be found in various places on the case surface. This works out very nicely. The guy sitting across from you at a LAN party will be thankful not to have his eyes burned out of his sockets by the gleaming surface of your case. If the case lighting is still too much for you, it can be completely deactivated. Thanks to the shape of the case, the dimensions of 396 x 269 x 55 mm (width x depth x height) do not make the notebook as bulky as it may seem. Still, the weight of 3.5 Kg is pretty heavy, rivaling that of some 17-inch notebooks. This makes it hard to call the notebook truly mobile, but taking it with you to your next LAN party or for a movie night at a friend's house shouldn't be much of a hassle. Longer trips, however, might not be too pleasant with the laptop weighing you down. The additional weight of the power supply, weighing in at a hefty 630 grams, is hardly noticeable compared to that of the notebook itself. MSI did not skimp on the ports, leaving no one displeased with the variety of inputs and outputs. On the left side of the notebook, you find 3 USB slots. Two of these are the new high speed USB 3.0 ports, the other being the typical USB 2.0. Moreover, the left side features a 4-in-1 card reader and an ExpressCard slot, which leaves room for connecting additional peripheral devices. Yet another USB 2.0 port is found on the right side, bringing the total to four. 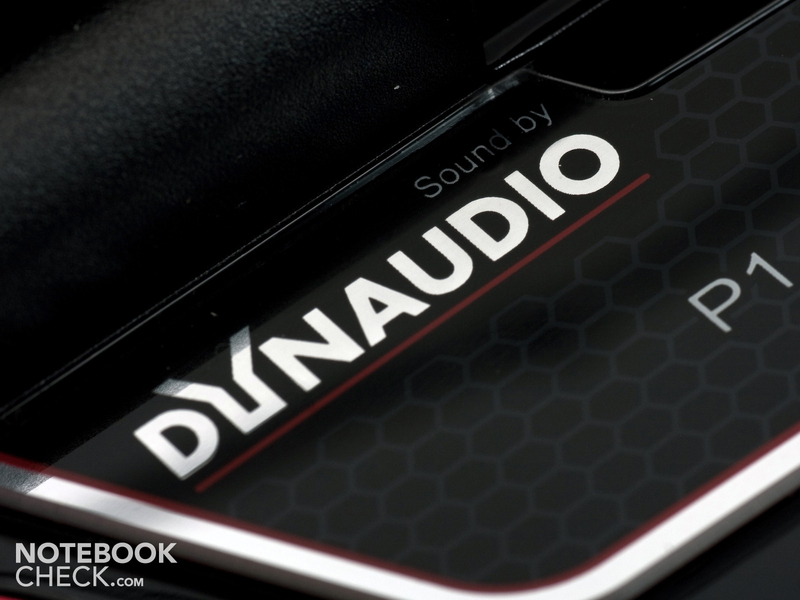 The four audio jacks allow you to hook up a surround sound system or an appropriate surround sound headset. Finally, the DVD burner is also found on the right side. There are no ports at the front, while the back has a VGA output, HDMI output, eSATA port, RJ45 ethernet port, the slot for the power supply and a Kensington lock slot. The placement of all these ports at the back is made possible by the fact that the battery is located elsewhere, thus freeing up the area. Having these ports at the back is really a plus when the GX660R remains in one place over a long period of time. Since the cables for the monitor, external hard drive and power can be hooked up in the back, there are less cables cluttering up the desktop than if these things were attached at the side of the notebook. The MSI GX660R provides you with all the wireless communication you could wish for. 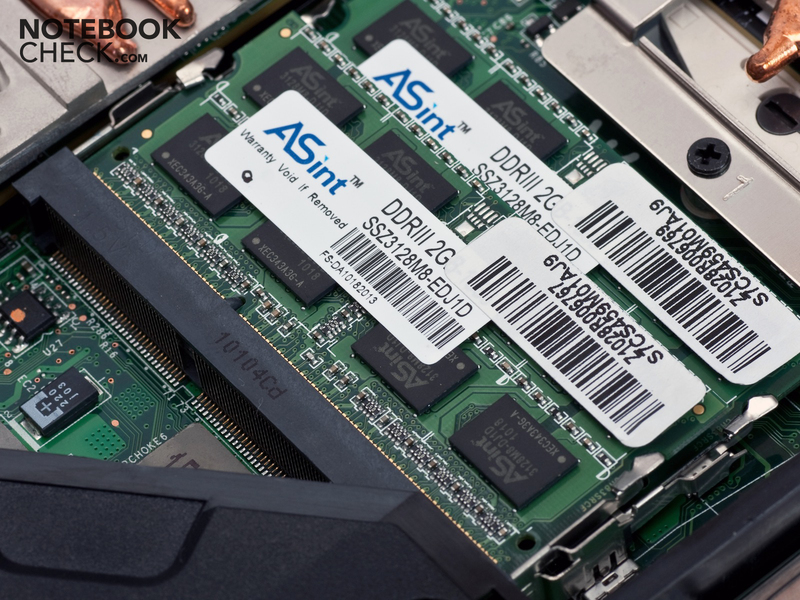 The Intel WiFi Link card supplies the notebook with the 802.11 b/g/n standard, which allows for fairly quick wireless transfer of data. The notebook comes equipped with Bluetooth 2.1 plus EDR (Enhanced Data Rate) as well, enabling wireless connection of mice, headsets or cell phones. The MSI GX660R also offers a gigabit ethernet RJ45 port. Since our test model is a preproduction sample, the accessories included in the package we received won't necessarily correspond to those of the finished product, especially considering how few there are. In addition to the laptop itself, we received a blank CD—meant to be made into a recovery disk and the usual documents with technical specifications. The manufacturer's warranty allows for 24 months of Collect and Return Service. The keyboard of the MSI GX660R is unfortunately very disappointing. It might make a good impression at first, but after typing out just a few letters the flaws are evident. The 14x14 mm chiclet keys would otherwise contribute a lot toward a high rating. Unfortunately, this doesn't make up for its other flaws. The keyboard is very flimsy and already starts to cave in under pressure of normal use. What's more is the clatter of the keystrokes gets pretty annoying. Nevertheless, the keyboard does have its good points. The large size and spacing of the keys helps to greatly reduce typos, making the the keyboard on par with desktop keyboards in this respect. On top of that, there's a number pad at the right side of the keyboard. Above the keyboard is a row of special function buttons and the power button. 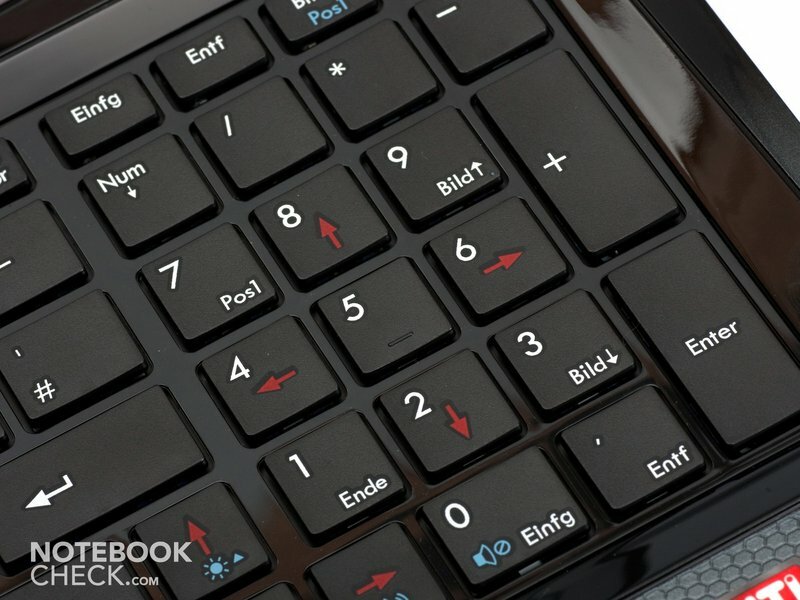 These buttons allow you to turn on or off the keyboard backlight, the case lighting and the turbo mode, for example. Since these are special function buttons, they are located on a smooth surface and can only be seen with the backlight on. The touchpad—diagonally measured at 91 mm—is quite large and offers all the space you could want. The surface texture is quite rough, making it comfortable to use. Nevertheless, there were lapses in performance when the cursor stalled. There is no multitouch gesture support as of now, but there are two strips at the right and at the bottom of the touchpad for vertical and horizontal scrolling respectively. The scroll areas are not labeled. If you prefer to hook up an external mouse, the touchpad can be deactivated with a keyboard shortcut. When buying this notebook, you should first make sure you have the model with the display you want. That is, there's an HD version (1366 x 768) and a full-HD version (1920 x 1080). Our test notebook was fitted with the HD display. The 15.6-inch display has an LED backlight, which is currently the standard for HD displays and translates to a thoroughly bright screen with good brightness distribution. Another trend that has recently caught on is the use of glossy displays—the majority of the current notebook selection is fitted with such screens, including the MSI GX660R. Glossy displays make it hard—sometimes almost impossible—to see the screen outdoors but help make colors more vivid indoors. The screen brightness of max. 228 cd/m² is perfectly good and the average of 218 cd/m² is fine as well. According to the numbers, the lower half of the screen shines more brightly than the upper half, but this difference is not noticeable to the naked eye. The black level and contrast ratio of the screen are, however, quite disappointing. The black level of 1.38 cd/m² is a somewhat high; a black level of less than 1 would be nice. On account of this, the maximum contrast takes a hit, which comes to a low 163:1. In terms of color space, GX660R's display does not reach the level of our reference models like the Dell XPS 16 with RGB-LED backlight or the display with extended color space of the HP Envy 14 (first model). Our test model comes with just an 08/15 display panel. Using the MSI GX660R outside is not recommended. the glossy display reflects ambient light to such an extent that it's hard to recognize anything on the screen. If you're assuming you can sit on the veranda of a café or in the park to play a game of Crysis or Starcraft II, the battery life alone is enough to cut that short. The MSI GX660R's display has a good range of viewing angles, particularly the vertical tilt of the screen which can bend back to 135 degrees. In the horizontal plane, you can still recognize what's on the screen when standing right next to the notebook, although the screen brightness does drop off at about 45 degrees. MSI did not skimp on the hardware for the GX660R. Powerful hardware is in place here and should be able to smoothly run games. 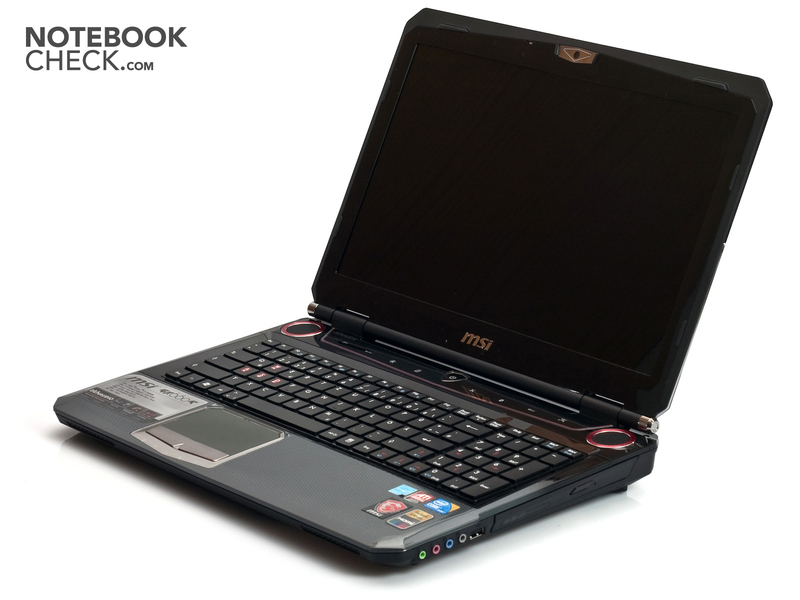 MSI has chosen the Intel Core i7-740QM as the processor for this notebook. The 740QM is a quad-core processor with four native cores and a total of 8 threads. The standard clock rate comes to 1.73 GHz and can be increased to a maximum of 2.93 GHz by means of the Turboboost technology. 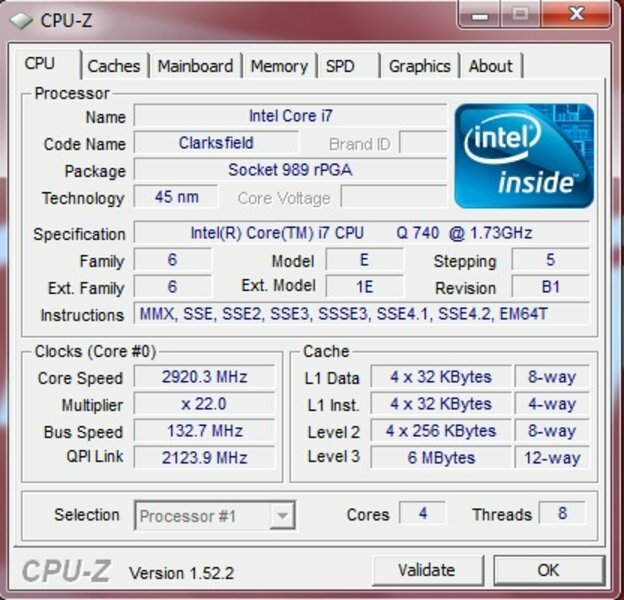 With an energy consumption of 45 watts, the 740QM is among the more power-consuming mobile processors offered by Intel. 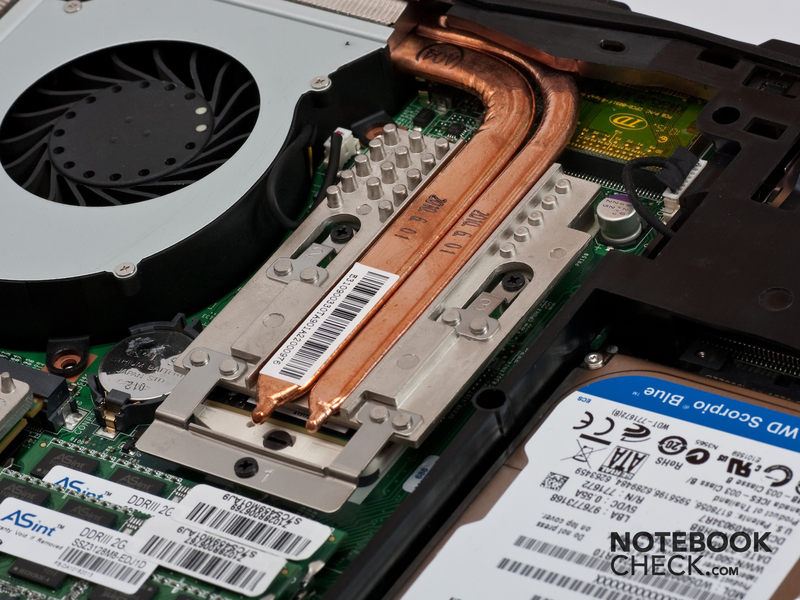 Cooling with the 740QM also has to be more intensive than with smaller CPUs, which is why the 740QM is usually built into larger notebooks. The graphics card here is the ATI Mobility Radeon HD 5870. This too is a powerful piece of hardware. It was put on the market in January 2010 and was then the fastest mobile single-core graphics card on the market until the Nvidia GeForce GTX480M usurped the throne. With a power consumption of up to 50 watts, the graphics card eats up more energy than the quad-core processor. The two together make a very powerful but very energy-consuming team. The GX660R is also equipped with two hard disks from Western Digital with 500 GB each as well as 4 GB of RAM. The MSI GX660R has a total of three slots for RAM. Two of those slots are found at the back of the notebook, while the third is located underneath the keyboard. Almost all the hardware is accessible through a large opening located at the bottom of the base unit, so that—other than a few screws—there's nothing in the way of a memory upgrade later on or a switch to an SSD. According to the Windows 7 Performance Index, all the components other than the hard drive perform exceptionally well. The hard drive is rated the slowest of the hardware at 5.9 points, but it's still very good compared to other previously reviewed conventional hard disks. 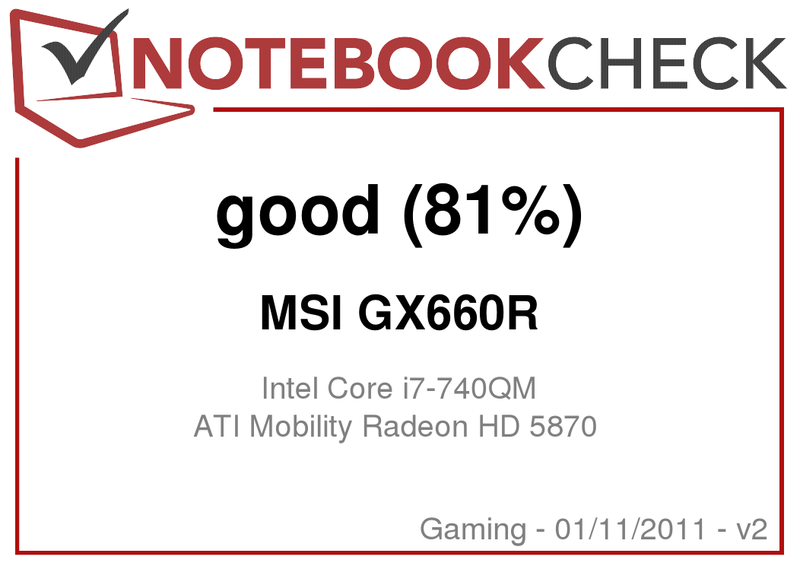 All the other hardware ranks in above the 7.0 mark and goes to show what a powerful notebook the MSI GX660R really is. We used Cinebench versions R10 and R11.5 to test the strength of the CPU. 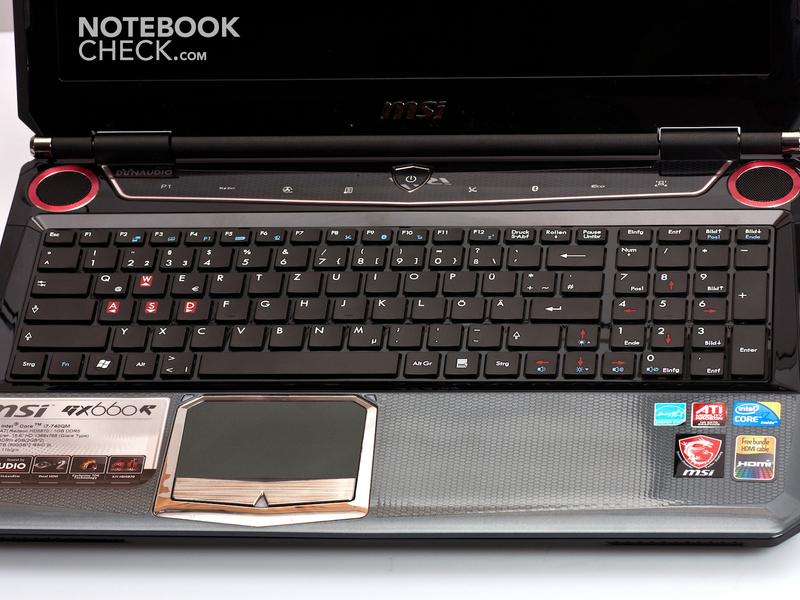 In these test, the MSI GX660R earned some outstanding scores. Especially with its 64 bit support, the quad-core processor really demonstrates its power. The GPU also does an excellent job in the Cinebench tests. The GX660R with the HD5870 GPU now leads the rankings board for the Cinebench R11.5 OpenGL 64 Bit Test and the Cinebench R10 Shading (64 bit) Test. In order to test the DirectX 11 capability of the graphics card, we used the Unigine Heaven 2.1 benchmark. The notebook achieved an average of 23.1 frames per second, thereby just barely falling short the 24 fps mark. Beyond 24 fps, the human eye no longer perceives moving pictures, promoting the illusion of perfectly smooth motion. 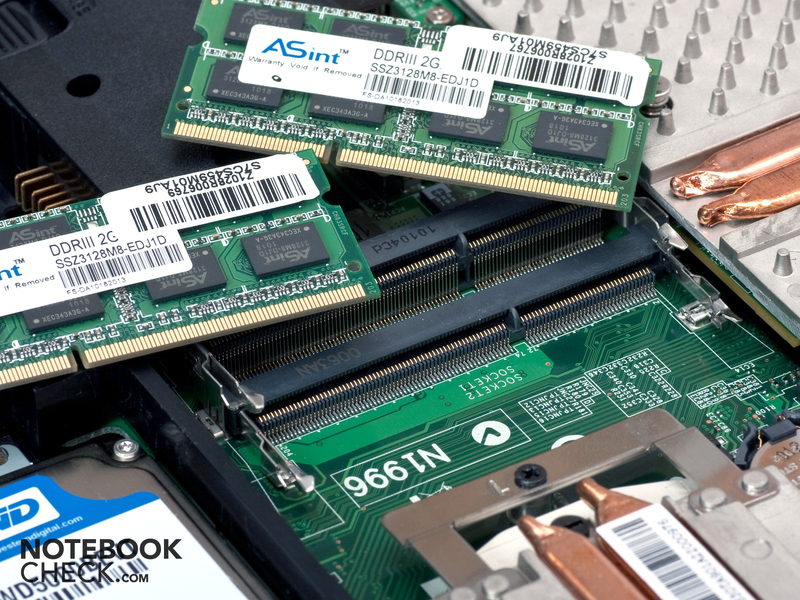 In the 3D Mark benchmarks our notebook with ATI Mobility Radeon HD 5870 ranks in quite well but doesn't manage to break any records here. Our in-review ATI graphics card is sadly defeated by the Nvidia GeForce GTX460M and the 480M. In the 3D Mark 06 benchmark, the GX660R makes it into the upper third with 13534 points and finds itself just behind comparable models like the Asus G73. The MSI GX660R is unencumbered by the demands of rendering HD video, playing HD-ready (720p) or full-HD (1080p) with no problem at all regardless whether it's off the hard drive or streamed off the internet. the HD Tune test on multiple hard disks in our sample notebook yielded some fair results. The average transfer rate of 112.6 MB/s demonstrates the HDD's good performance. The access time of 18.2 milliseconds is, however, a good deal higher than with other models. All the games we tested ran smoothly on the MSI GX660R. You can safely assume, therefore, that the notebook is well suited for upcoming releases. We used the turbo mode when running the games, thus increasing the processor's clock rate to over 3.0 GHz and triggering the cooling system to turn on earlier—which then runs much more efficiently, albeit very loudly. Starcraft 2 cannot be left out of current gaming benchmarks. The very popular real-time strategy game is run flawlessly by the ATI Mobility Radeon HD 5870. With the lowest detail settings on and a resolution of 1,024x768 pixels, the GX660R reaches a frame rate of 166 fps. With high detail settings on and a resolution of 1,360x768—displayed in 1080p—the GX660R manages a still very good 56 fps. The GX660R thus does not fall into anonymity among countless other notebooks of similar performance but rather takes its place as a leader in our rankings. The GX660R's performance is on par with the Deviltech HellMachine 720QM/ ATI HD5870), which also managed 56 fps. 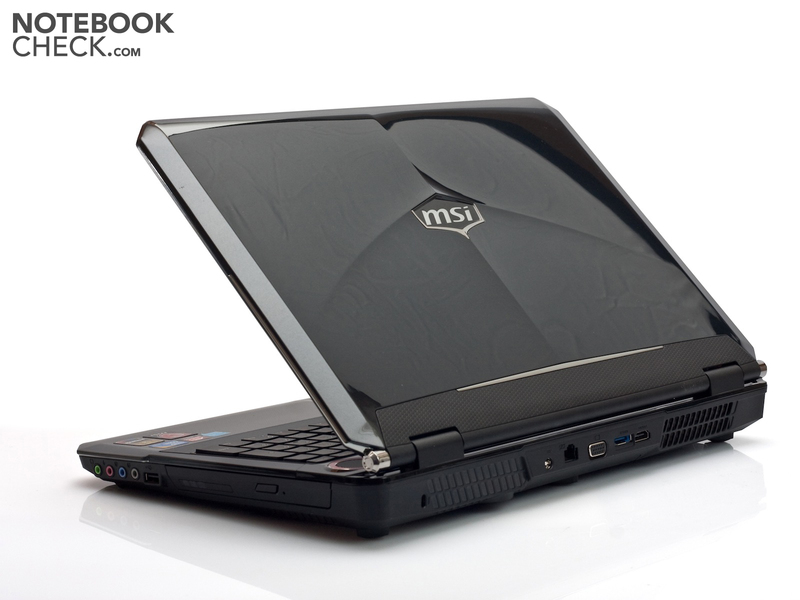 Our MSI test notebook however trails behind notebooks with a Nvidia GTX 460M graphics card like the Toshiba Qosmio X500-TZ1V (57 fps) and the Asus G73JW (GTX 460M - 68 fps). The action-packed shooter, FarCry 2 doesn't present any problem to the GX660R's combination of an ATI graphics card and quad-core CPU. 122 fps with the lowest detail settings and 58 fps with the highest settings makes FarCry 2 playable with any graphics settings on. In the rankings for FarCry 2, the GX660R also manages to snag one of the top spots in our rankings. 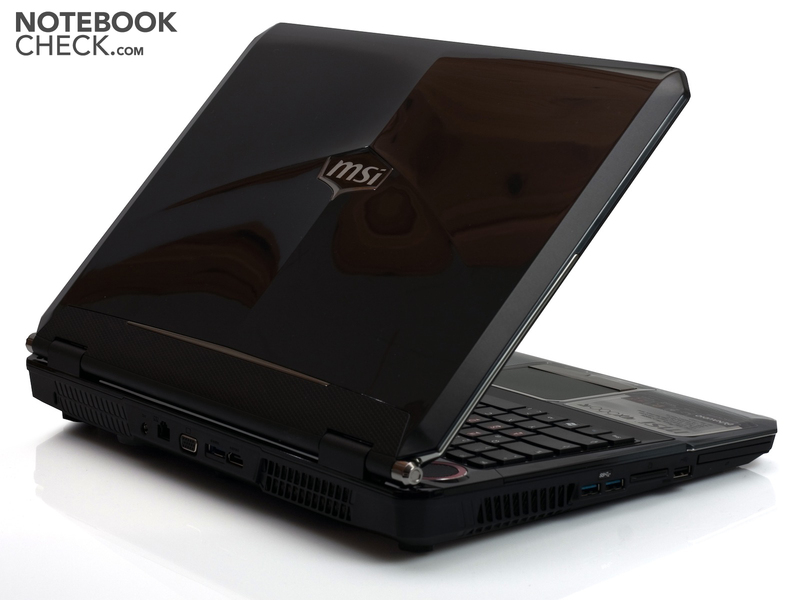 As before, the MSI notebook ranks in alongside the Deviltech HellMachine (ATI HD 5870 without Crossfire). But even the Crossfire version of the Deviltech HellMachine outshines its counterpart by a mere 10 fps. Crysis was for a long time the most graphics-intensive game out there and is therefore still used as part of our graphics benchmarks. 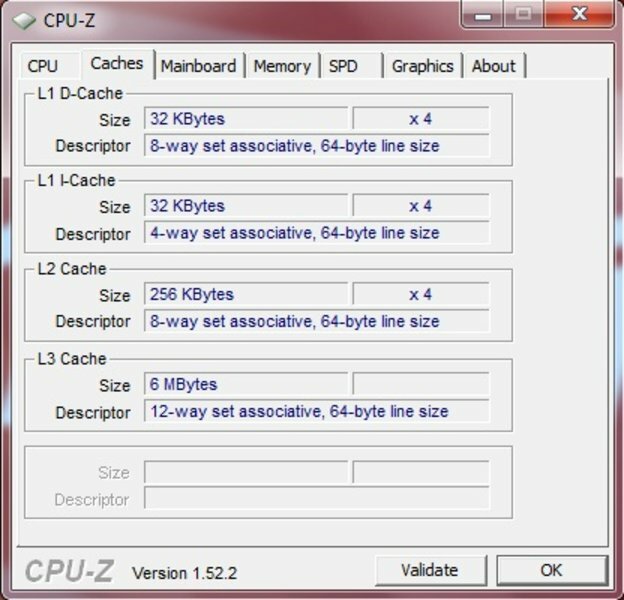 Moreover, the computations dealing with physics in higher detail settings constitute good testing conditions for the performance capacity of the notebook. But even Crysis hardly makes the GX660R break a sweat. At 116 fps with low detail settings and 56 fps with high detail settings, the game runs perfectly smoothly. In the Crysis CPU benchmark, the MSI GX660R does a bit better than the Deviltech HellMachine (without Crossfire). The MSI notebook does just as well in the Crysis GPU benchmark. Only the mySN XMG8.c (GTX285 SLI - 62.0 fps), the Clevo 901F (GTX 480M - 62.3 fps) and the Deviltech HellMachine DTX (GTX 480M - 68.8 fps) manage to outperform the MSI GX660R. The most recent Fifa version hardly got the GX660R to break a sweat. 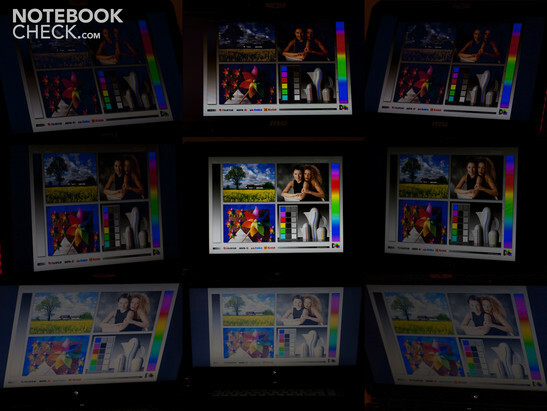 The notebook pumped out excellent values at every level of graphics settings. With high detail settings, the notebook actually managed to place at the very top in the rankings board. 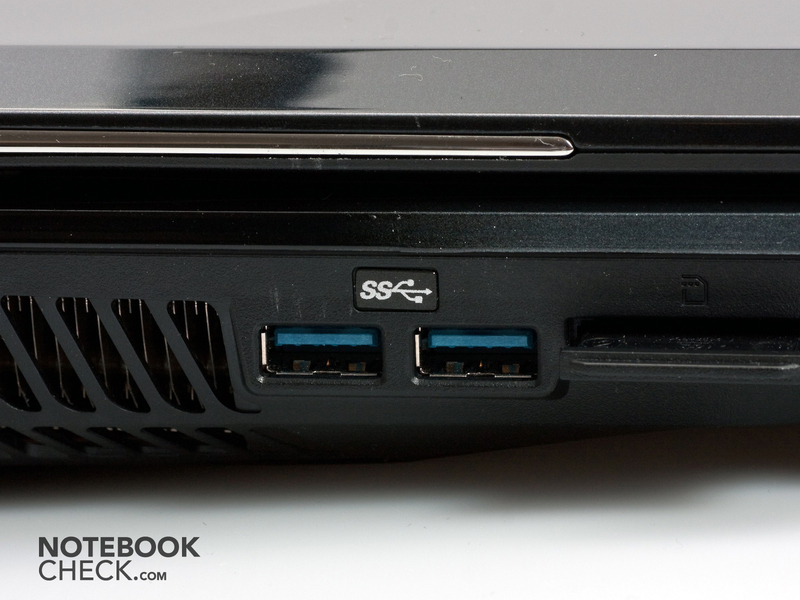 The MSI GX660R has a great deal of powerful hardware. This is evident not only by the tests we did but also by the noise produced by the fans. In idle mode, the noise level stays at an acceptable 31.7 dB(A). 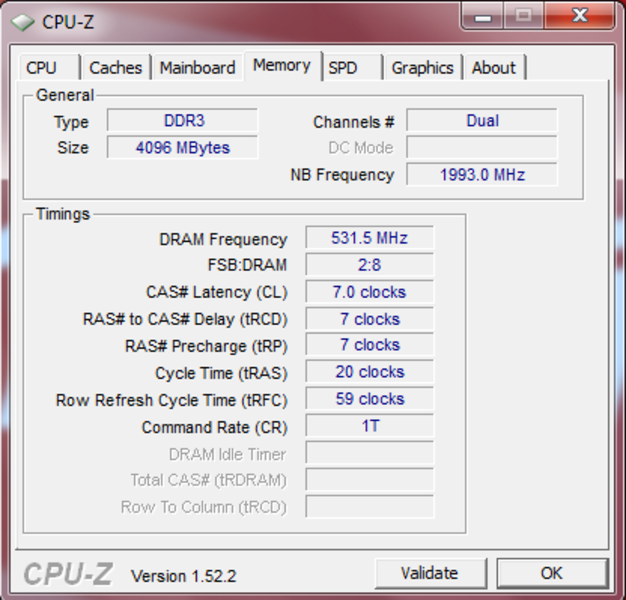 With the hardware active, the fans start spinning and the noise level rises to 47.4 dB(A). Turning the turbo mode on only makes things worse. 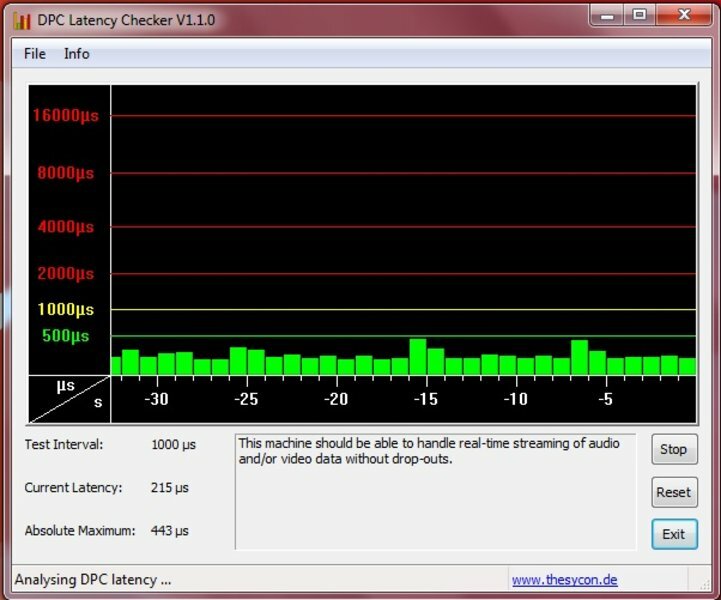 When using the notebook in turbo mode, which is most often the case when playing games, the fans produce and ear-splitting 52.3 dB(A). Considering the noise it makes, you'd think the notebook had floated up from the table and were flying across the room. If you want to watch a film or play a game, you'd better reach for your headphones because you won't have an easy time overshadowing the noise from those fans. In idle mode, you can hold the MSI GX660R on your lap without any worries and start surfing the internet or do some office work. 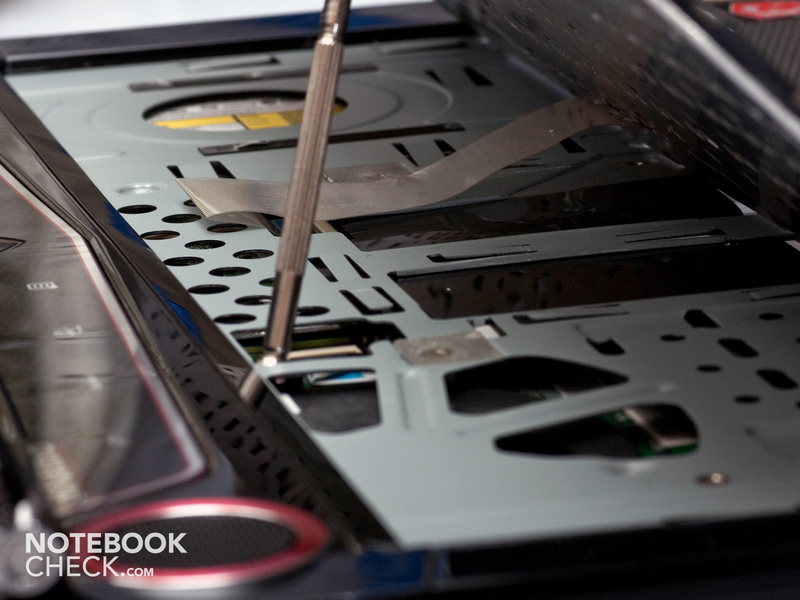 At a maximum of 28ºC, there's no danger of the notebook becoming too hot. The top part of the base unit barely gets over 25ºC, not particularly warm. In idle mode, the power supply stays cool. Under heavy use, only one section of the bottom of the base unit heats up noticeably, the rest remaining at just about the same temperature. If this particular spot does not come in contact with your legs as you hold the laptop on your lap, you can continue doing so even when the hardware is under the heaviest of use. The top of the base unit also heats up only slightly, keeping a good distance from the critical temperature range. 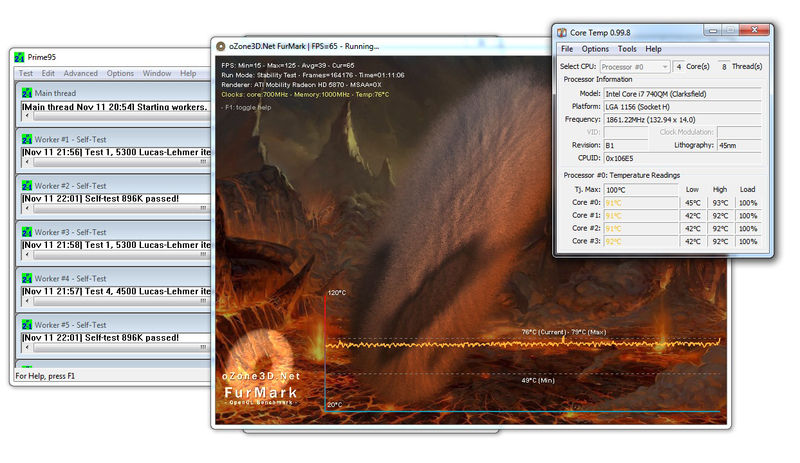 In the Torture Test with Prime95 and FurMark, we measured a CPU temperature of up to 93ºC. In the course of this drawn out Torture Test we did not notice any dropping off in performance. That is to say, even under long-lasting stress, the GX660R's hardware still functions at full capacity. 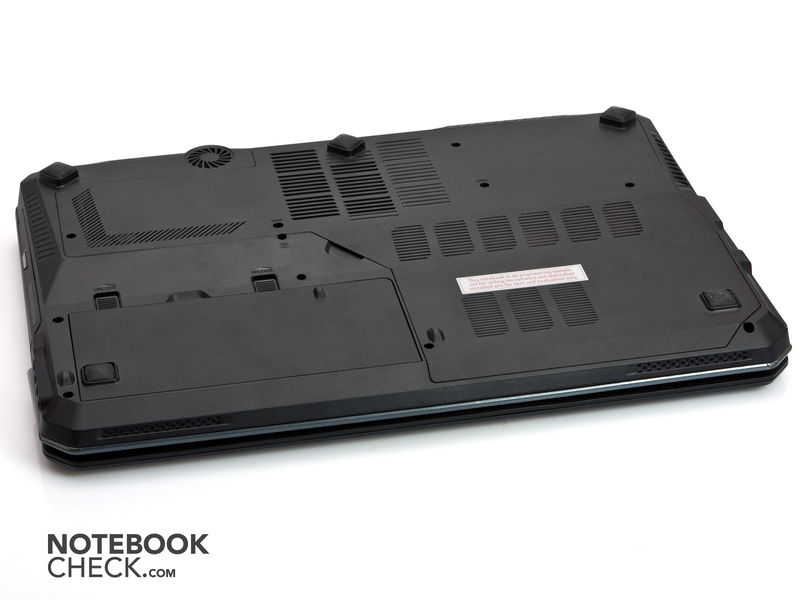 Once we reduced the high level of stress on the notebook, the temperature seriously dropped within a few seconds—the powerful cooling system helps a great deal in this regard. During the Torture Test, the power supply becomes quite hot at 50ºC. (+) The average temperature for the upper side under maximal load is 27.4 °C / 81 F, compared to the average of 32.9 °C / 91 F for the devices in the class Gaming. (+) The maximum temperature on the upper side is 32.5 °C / 91 F, compared to the average of 39.3 °C / 103 F, ranging from 21.6 to 68.8 °C for the class Gaming. (+) In idle usage, the average temperature for the upper side is 23.4 °C / 74 F, compared to the device average of 32.9 °C / 91 F.
MSI proudly advertises the Dynaudio speakers of its GX660R. The sound quality is truly better than that of most other notebooks. There's even a small subwoofer built in at the back to proverbially pump up the bass. However, other companies have tried this before MSI with the same result. The bass notes do actually ring clearer, but not by much. Just by looking at the size subwoofer, it's easy to tell that it won't significantly change the quality of the bass. Still, the sound that comes out of the GX660R makes a good impression. Moreover, the volume can be turned up a good deal before it sounds distorted. It's therefore possible to play music or watch a movie without having to hook the notebook up to external speakers. The battery life turns out to be quite short as expected. But as far as gaming notebooks go, the expectations for battery life are never very high. In the Readers Test from BatteryEater (min. 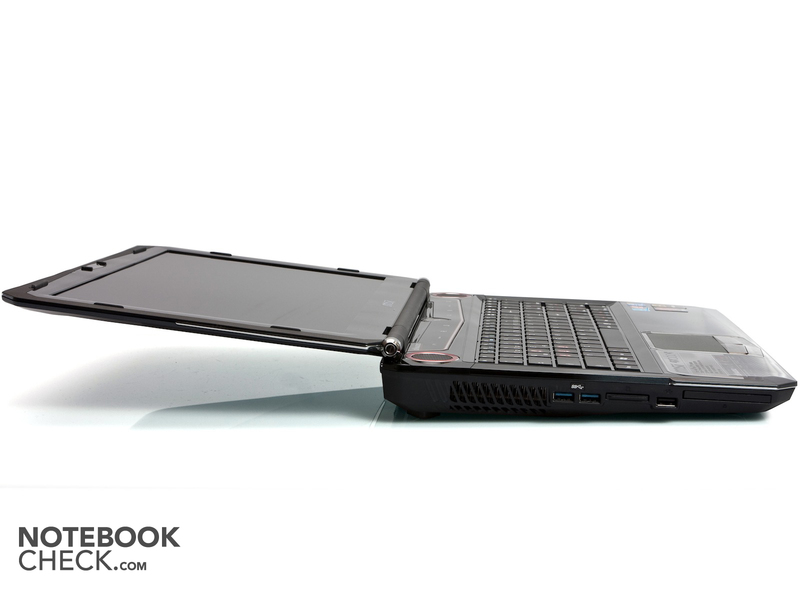 screen brightness, energy saving settings on), the GX660R manages to stay on for just over 3 hours (189 minutes). This should be enough to get some office work done. 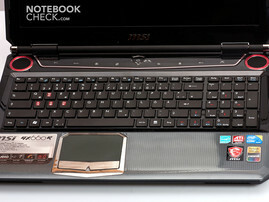 Under heavy use (BatteryEater Classic Test), the notebook shuts off after little over an hour (67 minutes). Having the turbo mode on doesn't shorten the battery life by much, which dropped to 62 minutes. From the level of noise during the Classic Test, we could tell that the notebook wasn't running at full capacity so that the battery life could actually be even shorter when playing games on the GX660R. For our DVD test we played the film, The Lord of the Rings: The Return of the King. At 217 minutes, it's pretty long as far as movies go. The battery life of 109 minutes in this case allows you to only reach the middle of the film. When using the GX660R for surfing the internet, you can count on a battery life of a bit more than two hours, (137 minutes). Looking at the power consumption of the notebook, it's no surprise why the 9-cell, 87 Wh battery only keeps the notebook running for little over an hour under heavy use. That is, the MSI GX660R uses up to 150 watts when it's under heavy stress. Even in idle mode, the GX660R still consumes about 50 watts. Compare this to a typical office notebook, which uses about 20 to 30 watts under normal use. At any rate, you shouldn't get too far away from a power outlet when using the MSI GX660R. The MSI GX660R has demonstrated an overall patchy performance. The notebook definitely proves itself to be a powerful competitor as far as gaming goes, running current releases with no problem at all. Its overall impression is, however, tarnished by the disappointingly flimsy keyboard. Other manufacturers, however, seem to manage to fit their gaming notebooks with decent keyboards. In the end, the keyboard plays a more important role than the touchpad, which is usually replaced by a mouse in any case. The overly loud cooling system takes away from the overall rating. The turbo mode seems unnecessary considering how loud the notebook gets. On the other hand, the MSI GX660R scores some points with its powerful performance, good speakers and sleek design. The GX660R is well suited for future games and can definitely attract some jealous looks at your next LAN party. If you're thinking about purchasing the MSI GX660, keep in mind that the gaming notebook's 9-cell battery does not contribute to a long battery life and it's always best to have a power outlet near-by. 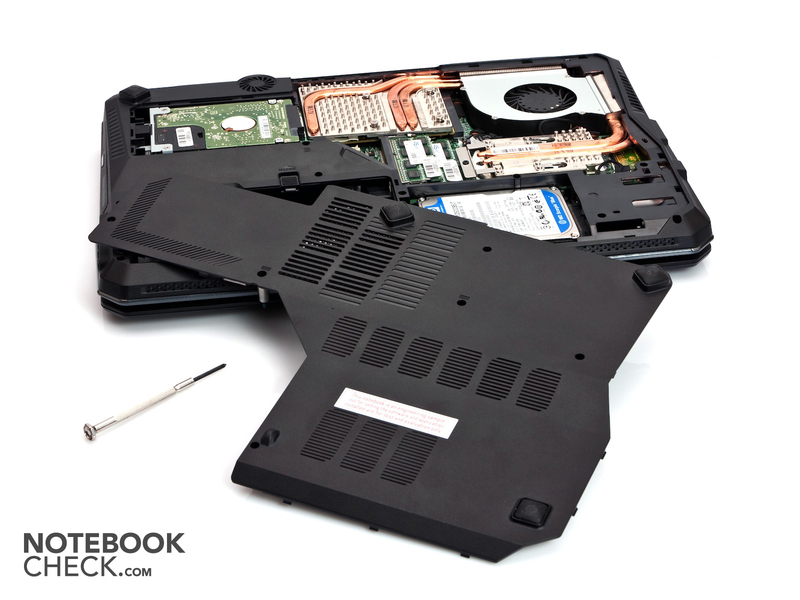 Other than that, the notebook has shown that it can make quite a lot of noise, either with its nice speaker system or—less pleasantly—with its cooling system. ...and is accessible through an opening, making it easy to upgrade the GX660R's hardware. ...the other is located beneath the keyboard. Both the hard disks, on the other hand, were easy to find. The battery is not particularly big. The notebook looks nice even in the dark. 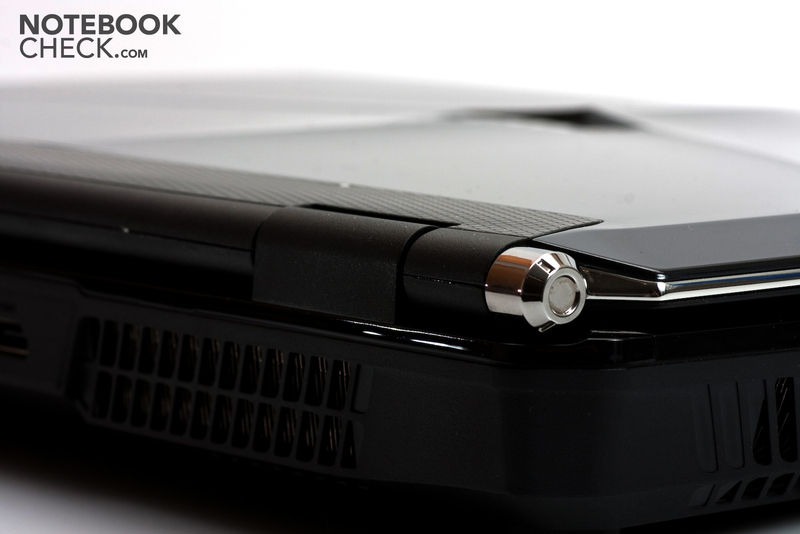 The back is fitted with ports useful for when the notebook is plugged in. 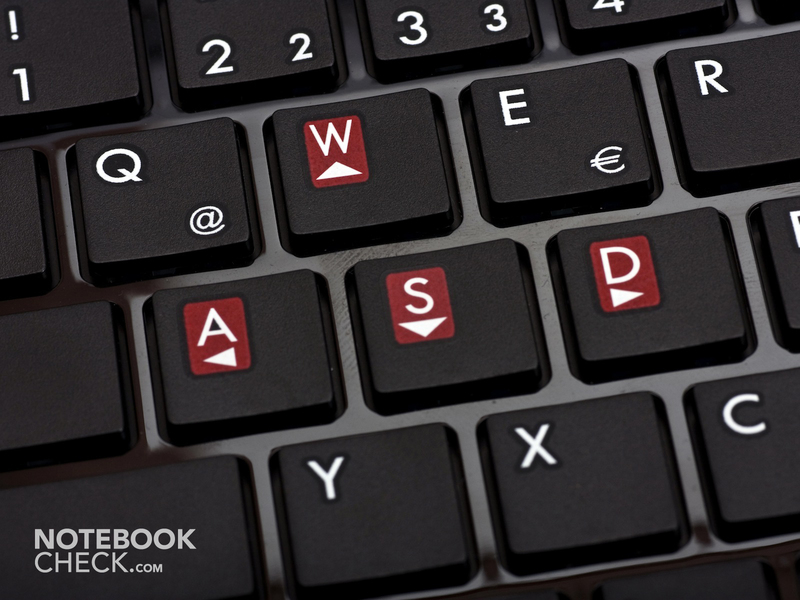 As a gaming notebook, the WASD keys are specially marked for use in games. MSI's gaming series has its own logo. Rare with 15-inch notebooks, a number pad. The power button is similar to the logo. The display hinges look good and hold the screen up firmly. The sleek hinges also allow the screen to tilt very far back. Two USB 3.0 ports are also included. 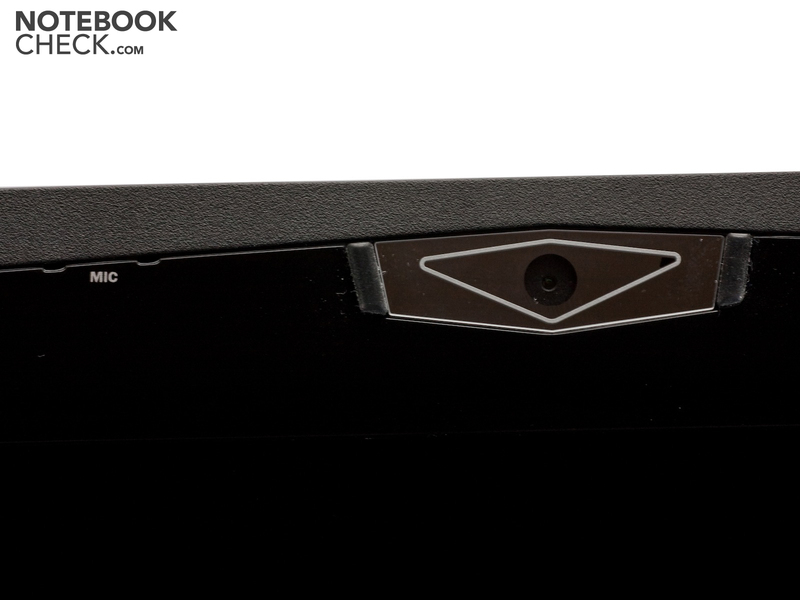 The webcam of the MSI GX660R. The good performance and nice design of the notebook. 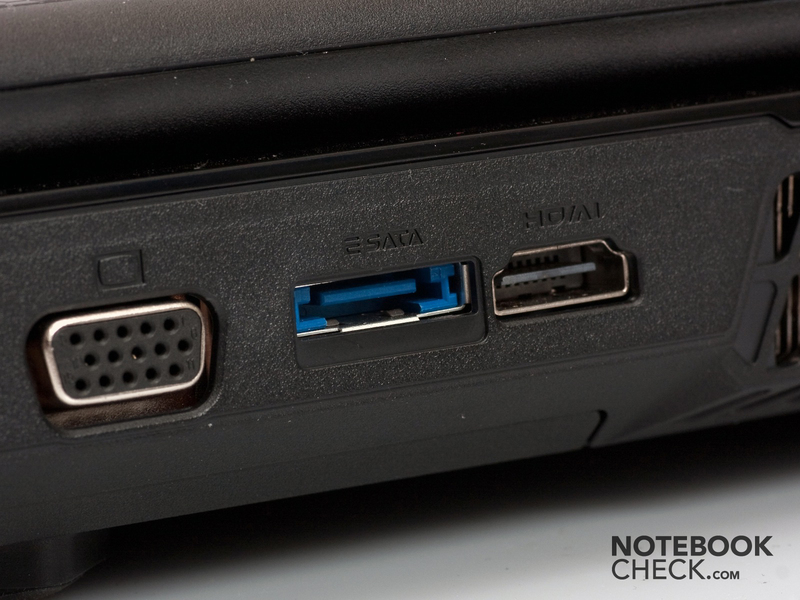 USB 3.0 ensures the notebook will continue to be useful in the future. That MSI recently fired their head keyboard technician/supplier. The Asus G53JW performs well with current games, but can also display them in 3D. The MSI GT660R is another good but expensive alternative.